Okay, so we've strayed away from our usual territory but indulge us a little... But first it seems only fair to confess that the whole Messiah thing was really just an added extra for us. We had discussed some time ago when watching the Last Night of the Proms on TV that we'd quite like to see something at the Royal Albert Hall someday, so when we had a free evening on our London trip that coincided with this performance it seemed too good an opportunity to pass up - particularly when we could get decent-ish tickets for £14.50 and a tour of the venue costs £8! Now of course given that we know even less about classical music than we do about theatre, we're in no position to comment on the quality of the playing or the singing (especially as we were seated side-on to the soloists and beside some of the choir), so lets just leave it that we were perfectly happy with the performances from all involved. 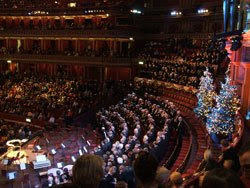 For the record, details of the choirs performing along with the Royal Philharmonic Orchestra can be found on the Raymond Gubbay website. But our visit was really about the venue and it really is something to behold. Yes, if you look at the detail closely enough it's in need of some attention but the scale and atmosphere in the place is truly phenomenal. I'm not sure that we would rush back for another concert, but given the opportunity to see something theatrical staged here I think we could definitely be persuaded to make the effort if we could combine it with other shows in London over a weekend. We don't quite think "The King & I" will be enough to lure us back but the Royal Albert Hall is now firmly somewhere whose listings we will keep a close eye on. And that's despite the fact that even a classical concert at such a venue doesn't appear to be immune from morons in the audience - who required a ticking off from Waldorf at the start of the second part of the performance. They then continued to chat to such an extent that rather than my usual ploy of escorting Waldorf to the exit quickly at the end of the show for fear of further 'incident', I tapped them on the shoulder myself and gave them a mouthful. I mean really, what is the point of clapping at the end of a show that you've shown no respect for throughout the performance - despite the fact that some of the choir were sitting literally two feet away.